Without a doubt, the popularity of the Ice Bucket Challenge, the social media phenomenon that continues to sweep the nation, has encouraged tens of thousands of Americans not only to douse themselves with ice water but also to open their pocketbooks and to donate to the fight against ALS. The ALS Association is extremely grateful for the generosity of these donors, and for the actions of several people who initiated and spread this incredible viral effort. They include Jeanette and Anthony Senerchia, Pat Quinn, and Pete Frates and his family. Their commitment to this cause has inspired the nation. I know that many people are wondering what The ALS Association is going to do with these donations, and my answer is this: invest prudently in helping people with ALS and their families and caregivers in the battle against the disease, while resolutely pursuing all avenues to extend, improve and ultimately save lives. Never before have we been in a better position to fuel our fight against this disease. Increased awareness and unprecedented financial support will enable us to think outside the box. We will be able to strategize about efforts in ways that previously would not have been possible, all while we work to fulfill and enhance our existing mission priorities nationwide. Funding groundbreaking research in laboratories across the globe. We presently support 98 active projects and recently announced $3.5 million in funding for 21 new projects led by the world’s top scientists. The ALS Association has championed some of the most significant discoveries to date. Providing vital support and care services through our nationwide network of chapters to people with ALS and their families in the form of support groups, medical equipment, respite grants and more, all while ensuring the highest standards of multi-disciplinary care through our Certified Treatment Centers of Excellence. Empowering ALS advocates to encourage their elected officials to support and advance issues important to the ALS community; and convening the largest gathering of people with ALS every year in Washington, D.C. to raise awareness of the disease and support government programs designed to help find a treatment and cure for ALS. In the weeks and months ahead, we look forward to communicating with people impacted by ALS, all of our donors and the general public about our continuing efforts in the battle against ALS. To learn more, visit our website at www.alsa.org. 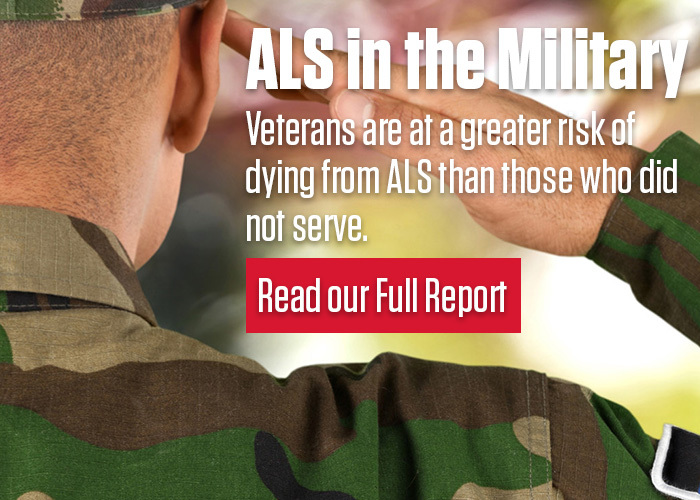 The ALS Association has the highest four-star rating from Charity Navigator and is a Better Business Bureau accredited charity as well as a Guidestar Exchange gold participant.